Adjudication of the Glór na nGael Competition is in full swing ! 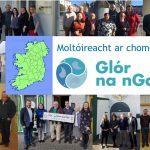 Three teams of adjudicators from Glór na nGael have started their circuit around Ireland to meet the community groups and committees that are taking part in the Glór na nGael competition. Fourty community groups and committees are being marked on the work they have done throughout the year to promote and enhance the use of the Irish language with themes encompassing many aspects of community life. This years prize fund is in excess of €85000.